I know, I haven't updated here in some time. 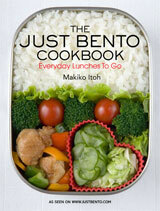 Why, you may ask, am I updating Just Bento but not Just Hungry? Well, I had actually stockpiled up some bento posts before the Big Move and Nomadic Period commenced, and also arranged for some guest posts. My plan was for Just Bento to go on semi-autopilot (which it has), and for Just Hungry to be updated with food-related things about my travels. But it hasn't quite worked out the way I wanted to on that front, due to getting really sick the first week on the road, then just being very busy. But anyway, here I am. As I wrote before, I have now moved out of the house in the suburbs of Zürich where I had lived off and on for some years, and I'm now roaming around looking for the new place to call home. At this point we are about 60-70% leaning towards 'somewhere in France' (to be determined where). So last week, we started looking at some houses for real. Now, we are mainly looking at houses that need some work done to them, since we figure that we'll get more for our money that way. Besides, we never totally like someone else's taste in decor anyway, so we might as well start off with an empty shell or something. Of the houses we've seen so far, the kitchens in two of them were particulary memorable. (Actually, most of the other houses didn't even have kitchens.) 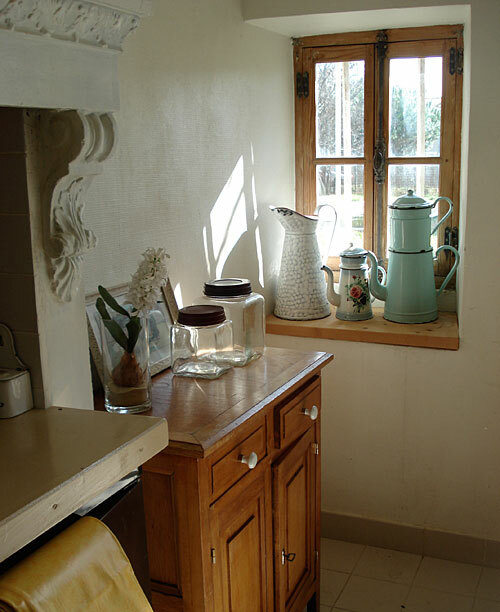 First up is this one, in a 1920s house in a town in the Vaucluse (a region in the northern part of Provence). Here's a closeup look. 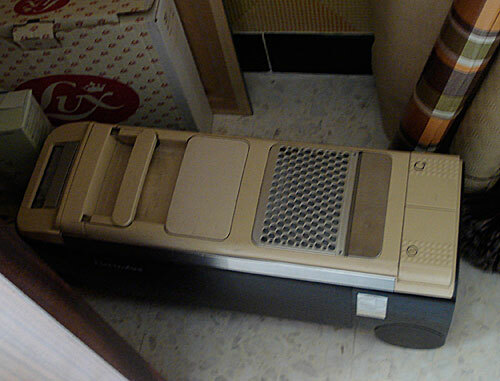 The chocolate brown cabinet thing is the tiny refrigerator - the other appliances (not shown, in a wall closet) matched. That fireplace...so gorgeous. The other side of the fireplace. I am not sure if those cabinets were used as worktops. Maybe the occupant used a kitchen table for working. In any case, it's a kitchen that is so different from our modern concept of what a kitchen should have. But despite the lack of 'worktop space', I am sure that the meals produced there were delicious regardless. Now here is another kitchen that left a deep impression on me. It's circa 1970s, un-renovated I think, and in perfect condition. It's a symphony of browns! Another view. The stainless steel handles, the mustardly-yellow tiles...the teak! Nothing says '70s like teak. And mustard-yellow. 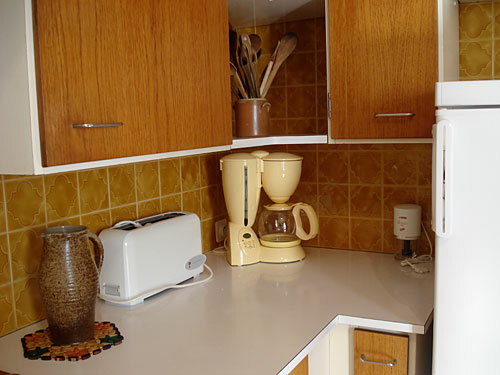 I'm pretty sure the appliances are not circa 1970s, but the plastic coffee pot does fit very well in here. Their vacuum cleaner seems to be from the same era as the kitchen. I wonder if it works? And the pantry down the hallway. It too was spotless. I do love the concept of a separate pantry. It's really fascinating to see for real how fashions in kitchens really do change so much over the years. Nowadays I guess we want lots and lots of working space, tons of cabinets, granite worktops, neutral colors, chrome and sleekness. I'm not sure we'd buy either of these houses, since it almost seems a shame to rip out the period kitchens (and other reasons). But it was so interesting, even educational, to have seen them in any case. We're going to see more houses in the upcoming weeks, and more kitchens. I can't wait. Submitted by maki on 2009-03-21 00:54. Wow, the first kitchen...the light is so beautiful. The one with the mustard tile looks like something you'd see in Reston, Virginia. [quote=Nicole M.]The one with the mustard tile looks like something you'd see in Reston, Virginia. Haha, agreed. One of the reasons I tend to turn down houses there is the 70s decor. Never feel bad about ripping out a 1970s era kitchen. XD We just renovated our kitchen, which was entirely avocado green and dark brown -- even the ovens and microwave were avocado green! Besides the obvious practical perks (how nice an oven that self cleans again, and a microwave that is probably not poisoning me from radiation! ), choosing your own color scheme just allows so much personality and life into a space, especially one that you use as much as a kitchen. it's really common in old houses in australia to stick the stove cooktop into the fireplace. I mean, that's where the old range was, right? But AVOID this setup if you can. Trust me, you bump your head on the mantlepiece above all the time, and you can't see into the pots at the back properly. They are also invariably badly lit. Oh, also, if the chimney has not been properly sealed off (One house I lived in had a piece of board sort-of nailed over the chimney hole) then it's a) drafty and b) prone to drop old bits of soot onto the stovetop. Interesting with others kitchens: I suppose, they give you an idea what you want and don't in your own kitchen. Oh wow, the first one is absolutely stunning. Even without all the modern conveniences, I'd love to cook in there. 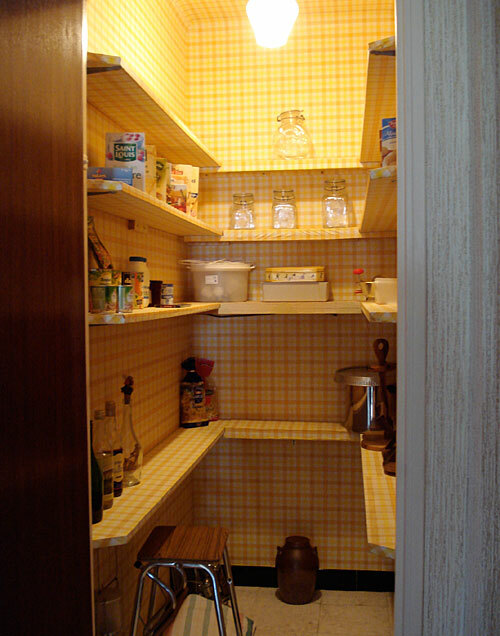 Don't get too excited about the idea of a separate pantry. As someone who's had one, they get old REALLY fast. Generally because you left a key ingredient and have to run back and get it right when a pot starts to boil over. 1970s era kitchens really aren't all they're cracked up to be. The first kitchen. Utterly charming but useless. I agree however with the previous comment about the light. I am no stranger to a 70's kitchen. 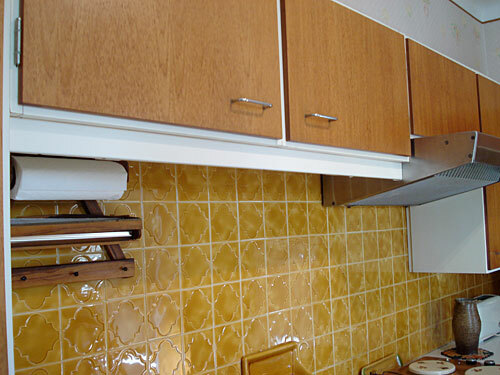 Avocado appliances and a similar quasi-ocher colored tile as the back splash, but ours was vinyl and on the floor! Los Angeles in 1970. We gutted ours as well. So many more efficient, energy conscious, and flexible appliances are available today. It is truly an opportunity to get the kitchen that you want. The pantry is a real godsend! So is a good source of ventilation from your cooking source. The floor plan and an available space to work with is key as well. Good luck Maki! 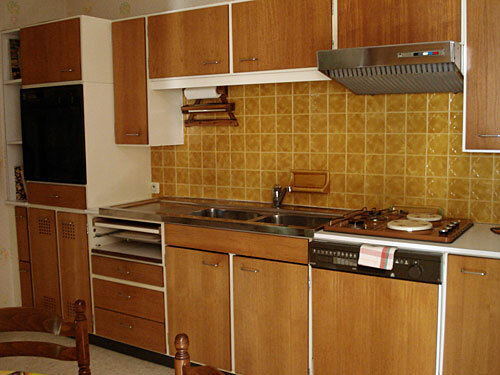 Huhuhu... talking about 70's kitchens, it reminds me of my parent's kitchen. They built it in the 70's and it's still the same ; it does look like the second one in terms of brownish-ness, except it's wood and tiles and not plastic (oh, and the blue 1920 wall coffee grinder ! love this device...) : from the dishwasher to the fridge, it's an ode to kitsh brown ! I hope you'll continue to enjoy your trip. It was a full, fairly big (for France) house, though they'd divided off a part of it to make a separate studio apartment (fairly common in Provence - they rent out the space to holiday makers and such for extra income). 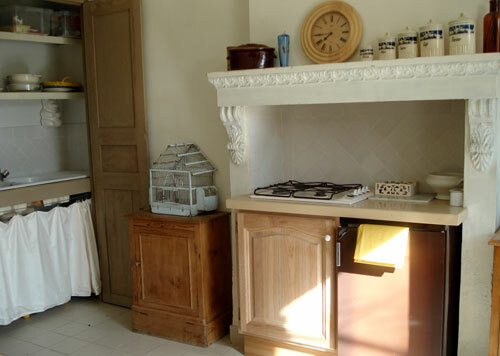 That has struck me though...kitchens in France in general (and this is not just the houses we've seen, but places we have seen/visited otherwise) are very small compared to US or even UK kitchens. Swiss kitchens are a bit bigger but still smaller than your usual US kitchen. Well, your photos of the second kitchen do bring back quite a few memories! And my grandparents still have the exact same stool you see in the larder. Best of luck with the house viewing, hope you are enjoying yourself in France. I'd die for that pantry. . .
Just out of curiousity, were these houses you visited still occupied by the owner, or just staged for potential buyers? If so what a hoot that they decided to stage the pantry as well. The 1920s house, the owner has passed away I think or something like that...there were still lots of personal belonging around the house, though everything was clean and things. The kitchen did look a bit staged, though the cabinets (opened up) were full of clutter. The 1970s house may have been staged...it's just been used as a holiday house by a family who live in Paris. It was really spotless, but there were still signs of real life (esp. in the bedrooms). Both kitchens are very similar to the kitchens in Uruguay. With the exception that on the pictures the kitchens seemed to be well kept. Whereas here -Uruguay- the kitchens are abused and almost non-exsistant. "No, I don’t get the birdcage either. It was sure pretty though." Maybe the bird was there in case of a gas leakage? urr...that's a frightening thought somehow. I think the former owner actually had birds...there was another (big) birdcage in the house too. That pantry is so cute! Also we totally have an old vaccuum like that at home. It has a huge button that you hit with your foot to turn it on. We are trying to convince my mom to get a Dyson. I am amazed with how clean those kitchens are. My husband and I are house hunting right now too, and even the non-bank owned ones are filthy. 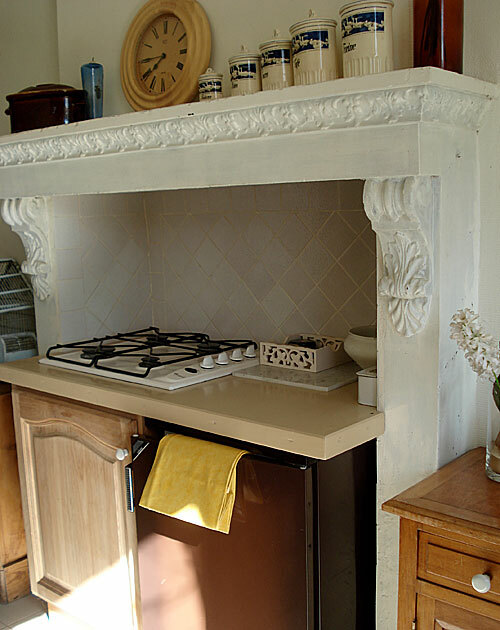 It is fun looking older kitchens, the ones we have been looking at are original from the 1940 and 1950's. So cute and such sturdy construction. But I have been turned off by the so-called modern kitchens (granite, etc. ), they really do not seem to fit into the war and post-war era homes. And one place that we looked at had a stainless steel commercial grade range (6 burners, built-in grills, and multiple ovens). I cook a lot, and I cannot see myself actually utilizing all of the features but I can see myself getting really annoyed with cleaning that beast of an appliance. So far we've only seen one house that was very messy...but it wasn't actually dirty or filthy. I guess we either we've been lucky, or French people are more cleanliness aware? The one house that was messy, we were told, the owners went through a divorce (which is why they are selling) and I think the husband lives there now by himself, with the kids visiting sometimes...the kids' room was a mess with toys everywhere, unmade bed etc...but the kitchen and bathroom were cluttered yet clean. It is so depressing to see other peoples' houses that are not kept up in terms of cleanliness...I think it sort of reflects their state of mind. The idea of a 6-burner stove is tempting, but I hear you about the cleaning! As much as I love gas cooking, I am wondering if sticking to easy-clean ceramic top might be better for maintenance purposes! Seeing other people's houses in disarray and filthy, has been a common thing in the area (foreclosures have taken their toll in California, many houses are missing items and have extra junk just piled here or there). There have been a number of houses where the first thing we would have to do is clear debris and get appliances to replace the ones the former occupants took with them. I wish I could say that the condition was due to neglect, but some people honestly live like that. But the good thing about there being missing appliance is I can get what I want. And ceramic-top stove is something that I was really hoping to get, having to take apart a stove to clean it constantly (I have a mess maker for a husband) really gets to me about as much as having a dirty stove. Keep in mind that with glass-top stoves you cannot use cast-iron pots or pans on them. (I don't know if that applies to those with ceramic coatings.) Apparently the iron will react with the glass and wreck the glass. Those tops are very expensive to replace. They are easier to clean, using a single-edge razorblade to scrape off burned on food and a special waxy glass cleaner/polish. The Vaucluse, eh? It's a beautiful, beautiful area! We live in la Drôme, just above, and we do quite a bit of climbing in the Vaucluse. Vaison has a really nice chocolaterie there. Which one are you leaning towards? Nicole M: as a DC metro area resident, I'm laughing at your Reston, VA reference. When I was househunting, I never saw a kitchen I really liked. So, I pretty much accepted the fact that I was eventually going to rip it out anyway. It's my understanding that in many places in Europe, kitchens are free standing, and that you take the cabinets with you when you move, which, quite honestly, makes a lot more sense to me. Kitchen cabinets are essentially furniture. If I'm not going to let someone pick out my bed, why would I let someone choose my kitchen cabinets for me? Also, when I wrote "rip it out," I meant rip it out in a manner in which they could still be donated to Habitat for Humanity and reused. I grew up in the 50's in a mid-western farmhouse that had been built in the 1870's (13 rooms). Kitchen so big that my mom racked her brains to put stuff in it so she wouldn't have to walk so far. She was so happy to get a breakfast bar/cooker combo in the middle in addition to our 8-seater table to get rid of some space. There was an outside pantry, a room really, that was all cabinets and so many empty drawers that our cat selected one of the laundry drawers in which to have her kittens. A wonderful back staircase lead upstairs to what had once been an upstairs servant's room--I used it stage sneaky raids into my sister's upstairs bedroom through the back stairs and her bedroom backdoor. Kitchen also had a full sized heating stove--in addition to the cooker--around which the whole family gathered on freezing mornings to get dressed.A common morning kitchen scene was my father coming up from the basement with a pail of red hot cinders from the coal burning furnace in the basement and passing through the kitchen on the way to the mud porch to empty the hot cinders. I hope you don't mind my asking: did you just randomly decide to move? I ask because it's always been a dream of mine to move abroad (I live in the U.S), but the thought of a completely different job market and culture is so daunting. For someone to say 'I decided to look for a house in somewhere in France' is something that seems so strange to me. In a good way!